This is FRP recycle bins.Its a German imported product.No need to use any garbage cover in it.Its easly washable and very elegant looking. 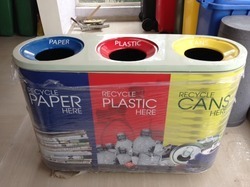 We offer wide range of Recycle Bin. We hold expertise in manufacturing, supplying and trading a superior quality range of SS Recycle Bin. Our offered range is manufactured using optimum-grade material that is sourced from trustworthy and reliable vendors of market. These products recycle the wastage and remove all the impurities thus providing clean, fresh water. We are Manufacture of frp color coded recycle bin in good quality and fenishing. As per the needs and requirements of our clients, we are involved in providing Recycling Bin Container.